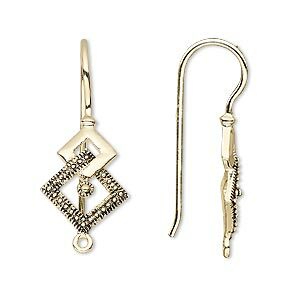 Ear wire, antique gold-finished bronze, 28mm fishhook with 19x13mm double diamond and closed loop, 18 gauge. Sold per pair. Item Number: H20-A9037FN Have a question about this item? 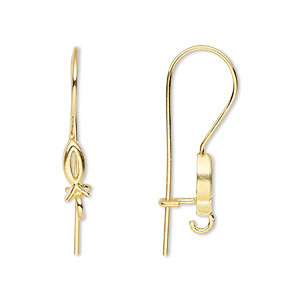 Get an expensive look for a fraction of the price of precious metals with these elegant ear wires. An attached closed loop also gives the ability to customize with any variety of embellishments. 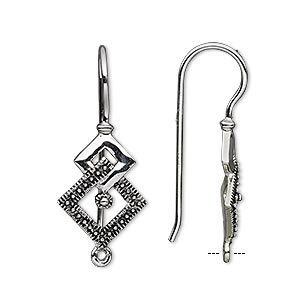 Ear wire, antique silver-plated bronze, 28mm fishhook with 19x13mm double diamond and closed loop, 18 gauge. Sold per pair. 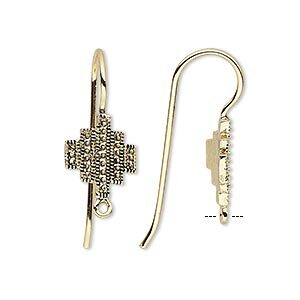 Ear wire, antique gold-finished bronze, 26mm fishhook with 13x11mm Southwest design and closed loop, 18 gauge. Sold per pair. 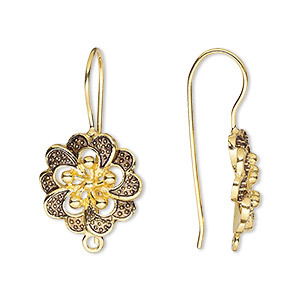 Ear wire, antique gold-finished bronze, 30mm fishhook with 15mm flower and closed loop, 20 gauge. Sold per pair. 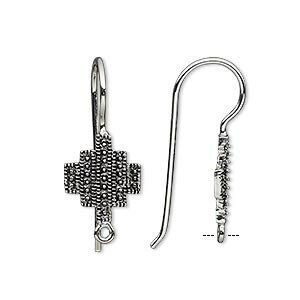 Ear wire, antique silver-plated bronze, 26mm fishhook with 13x11mm Southwest design and closed loop, 18 gauge. Sold per pair. Ear wire, green onyx (dyed) and gold-finished sterling silver, 15mm fishhook with open loop, 18 gauge. Sold per pair. 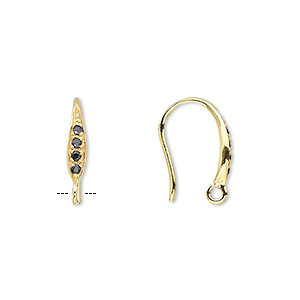 Ear wire, black spinel (natural) and gold-finished sterling silver, 15mm fishhook with open loop, 18 gauge. Sold per pair. 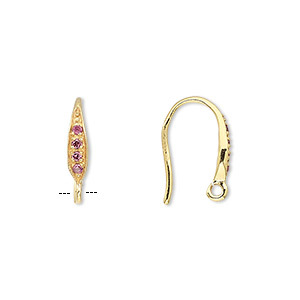 Ear wire, garnet (natural) and gold-finished sterling silver, 15mm fishhook with open loop, 18 gauge. Sold per pair. 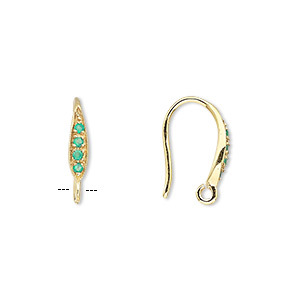 Ear wire, gold-plated brass, 25mm fishhook with safety and Christian fish with open loop, 18 gauge. Sold per pair. 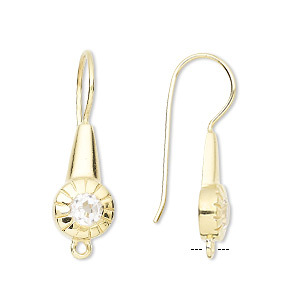 Ear wire, white topaz (natural) and gold-finished sterling silver, 15mm fishhook with open loop, 18 gauge. Sold per pair. 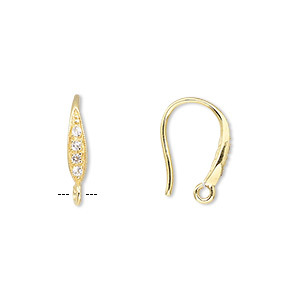 Ear wire, quartz crystal (natural) and gold-finished brass, 28mm fishhook with lines design and closed loop, 20 gauge. Sold per pair.